As the No-Build scenario showed, geometric improvements could be considered at several intersections even without the Development Plan. The list below describes the intersection improvements that have been approved and/or stipulated by the Town of Chapel Hill. Some of these have already been implemented. Columbia Street / South Road / McCauley Street: Improvements at this intersection are complete. The improvements included remodeling to improve pedestrian safety, as well as an exclusive left-turn lane on the McCauley Street approach that was accomplished through pavement marking changes without widening the road. South Road / Country Club Road: Improvements have already been made here without widening the road. A northbound right-turn lane has been added, and the southbound shared through-right lane has been converted to a shared left-through-right lane. In addition, realignment of the Ridge Road / County Club Road intersection, to give priority to Ridge Road, has been recommended as a long term option. Cameron Avenue / Raleigh Street: Signal phasing changes have been implemented to improve traffic flow. As discussed earlier, the Town has indicated the possibility of revisiting this intersection and considering the implementation of an exclusive westbound right-turn lane on Country Club Road. Country Club Road / Battle Lane / Boundary Street: Bollards and chains have been strategically provided to control pedestrians in and around this intersection, and a stamped asphalt pedestrian crossing was installed. If the Town and University determine that other improvements are necessary, the University will coordinate with the Town to design and implement the agreed upon improvements. Country Club Road / Gimghoul Road / Paul Green Theater Drive: A traffic signal including pedestrian countdown heads has been provided. Manning Drive / Skipper Bowles Drive: Based on peak period counts and the accident history at this location, turn restrictions have been implemented to prevent eastbound left-turns from Skipper Bowles Drive onto northbound Manning Drive during special events. Recent changes in the parking allocation of the Development Plan indicated the potential for an increase in the number of parking spaces accessible via Skipper Bowles Drive. It was noted in past Annual Reports that the University would collect additional traffic volume data at this intersection to perform a more thorough analysis to determine if applicable warrants for the installation of a traffic signal are met. The proposed changes to the parking allocation, while still included in the Development Plan, have not been constructed. Signal warrants were performed for this intersection in the TIA update and the intersection does not meet the warrants for installation of a traffic signal. South Columbia Street, between Manning Drive and South Road: The cross-section of this portion of South Columbia Street has been altered as stipulated to remove a vehicular travel lane and to add an exclusive bike lane and an exclusive bus lane. Construction of the accompanying streetscape features are complete as well. A new pedestrian activated traffic signal at the intersection of South Columbia Street and Medical Drive was also constructed as part of the streetscaping project. Manning Drive / Fordham Boulevard: Stipulated improvements for this intersection have been completed. The University provided funding for the stipulated street lighting. The University also prepared traffic signal upgrade plans in coordination with the Town and NCDOT for the stipulated traffic signal upgrades at this intersection to improve pedestrian safety. The Town of Chapel Hill utilized contractor services to complete the intersection upgrades. Fordham Boulevard / Old Mason Farm Road: Stipulated improvements for this intersection have been completed. The University has provided funding for the stipulated street lighting. The University also prepared traffic signal upgrade plans in coordination with the Town and NCDOT for the stipulated traffic signal upgrades at this intersection to improve pedestrian safety. The improvements to the traffic signal have been completed. Mason Farm Road / East Drive: A stipulated traffic signal for this intersection has been constructed. The University prepared the necessary traffic signal plans and provided those plans to the Town of Chapel Hill. The Town utilized contractor services to construct the new traffic signal. Mason Farm Road / West Drive: A new traffic signal was stipulated at this intersection. The University designed and implemented a temporary traffic signal to operate at this intersection until construction of Marsico Hall was completed. The construction of Marsico Hall is completed and the final signal featuring metal poles with mast arms is to be constructed in early 2016. Ridge Road: Resurfacing has been stipulated along the length of the road. Other safety improvements have already been made near the Rams Head Center and other pedestrian safety enhancements have been constructed adjacent to Boshamer Stadium and were completed in 2010. The University is performing a study of potential improvements to pedestrian and bicycle facilities on Ridge Road. Manning Drive / Ridge Road: Although traffic delays are not an egregious problem here, there are speed and appearance issues. Measures to reduce and calm traffic and to enhance pedestrian safety should be studied. Measures to encourage pedestrians to cross at the intersection have been implemented. Table 3.1 shows the proportions of employees and students traveling to campus by each mode of transportation (‘mode splits’) in 2001, 2004, 2007, 2009, 2011, 2013, 2015 and 2017 plus the current targets for 2024. The latest commuter survey was carried out in spring 2017. In 2001, the University was already performing well, with 28% of employees and 67% of students using alternative modes to reach the campus. The 2004, 2007, 2009, 2011, 2013, 2015 and 2017 commuter surveys provided a snapshot of progress part-way into the Development Plan, and the 2024 targets have been updated in light of this experience. the University has invested heavily in improvements to alternative modes. Chapel Hill Transit (CHT) and GoTriangle have been particularly popular. This is a successful result of investment in fare-free transit, subsidized GoPasses and other service enhancements. It appears that some employees living in Chapel Hill and Carrboro are choosing to drive to a park-and-ride lot rather than walk to a local CHT stop, in order to take advantage of the more frequent transit service. This may not be as big a problem as in the past because of the new park-and-ride fees which have reduced use at park-and-ride lots. Also, geocoding data suggest that University employees are living further away from campus than in previous years, increasing the value of park-and-ride compared to CHT. “Carpool/vanpool” includes drivers and passengers. “Bus” includes Chapel Hill Transit and Regional Transit. “Other” includes motorcycles, dropped off, work from home, etc. Methodology and data analyzed for estimating air quality impacts are explained in more detail in Section 3.5 of the December 2017 Development Plan TIA report. 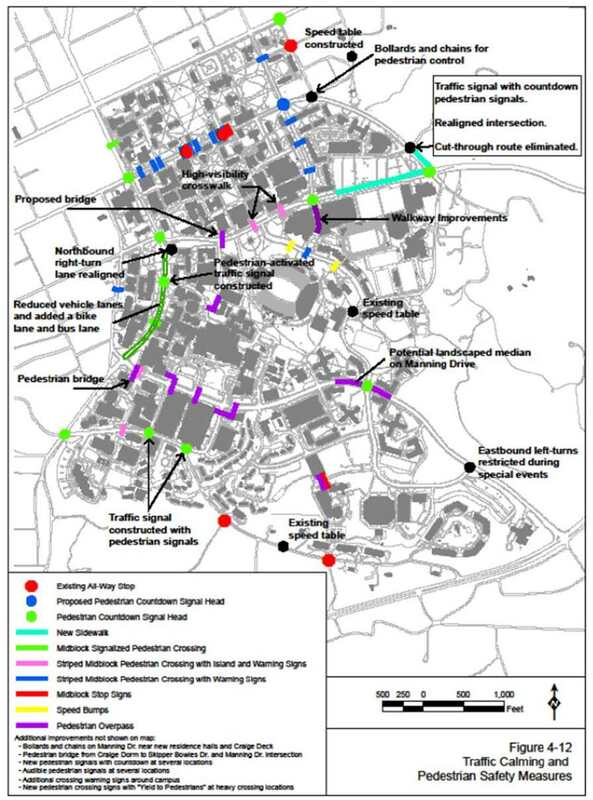 Figure 3.1 shows the recent traffic calming measures implemented on campus, as well as some potential long term projects. Some of the potential long term measures may include pedestrian and bicycle improvements. Recent improvements include new pedestrian countdown signal heads at several intersections, new sidewalks, and new mid-block pedestrian crossings using a variety of engineering treatments. The Transportation Impact Analysis (TIA) guidelines agreed to by the Town of Chapel Hill and the University in 2001 do not require the TIA to analyze traffic calming in adjacent neighborhoods. However, the University maintains an ongoing dialog with the Town about possible impacts and potential mitigation measures. Not only has the University agreed to provide traffic calming measures on campus, but the University has also agreed to provide traffic calming measures on streets in neighborhoods immediately adjacent to the campus. As part of this process, the University worked with the Town’s traffic engineering staff and with neighborhood residents. Table 3.2 shows the streets that were considered for possible impacts and potential mitigation measures. The measures that were agreed upon have all been implemented as indicated in Table 3.2. The measures were designed and implemented at no cost to the Town. The Town will maintain the traffic calming devices on Town streets. In 2011 Town staff indicated some neighborhood residents had applied to the Town to consider additional traffic calming to be implemented. The University gathered daily traffic volume and vehicle speed data at three locations on streets where traffic calming measures had been constructed. The data was provided to the Town staff for use in their assessment of the resident’s application. To date, the Town of Chapel Hill has not taken action to modify the traffic calming measures that were designed and constructed by the University.